Responsive Hospital Ward Clerk who excels in organizing and managing a seamless flow of work patients and visitors to the ward. Outstanding interpersonal skills patient care coordination medical record management andmaintaining the ward’s equipment. Collaborative approach with expertise in managing the ward’s supply requisitions and returns. Welcomed patients and visitors and directed them to desired departments and services. Coordinated smooth flow of ward activities and care for the 42-bed unit. Scheduled more than 10000 specialist visits specimen collections and transportation to other units for the ward’s patients. Managed patient files and ensured that all labs referrals and discharges were documented. Maintained ward desk equipment and supplies. Worked collaboratively in a team of 15 to provide seamless compassionate care to patients. Ensured the smooth work processes of the 30-bed inpatient ward. Received patients and visitors to the ward and directed them to correct rooms and departments. Stayed abreast of all nursing and patient care assignments in ward and contacted technicians physicians and other staff as appropriate. Ordered supplies received inventory and arranged for supply returns as needed for the ward. Managed more than 8000 patient files verifying documentation and preparing paperwork. There are plenty of opportunities to land a Hospital Ward Clerk job position, but it won’t just be handed to you. 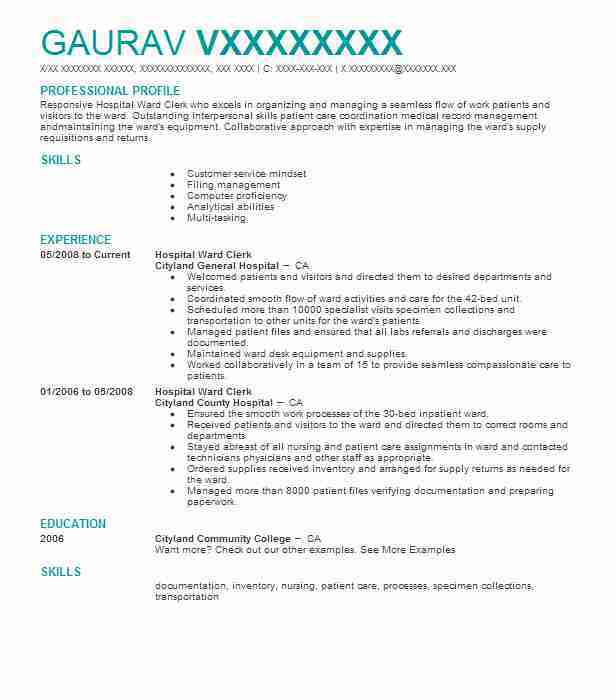 Crafting a Hospital Ward Clerk resume that catches the attention of hiring managers is paramount to getting the job, and LiveCareer is here to help you stand out from the competition.